Yes, those t-shirts for young girls say “Intifada NYC.” These were sold at the Arab Fair in Prospect Park on July 8 . Is this the kind of “middle eastern cultural enrichment” that Dhabah Almontaser, principal for Khalil Gibran International Academy, will bring to her students and teachers? Since Chancellor Klein’s office has approved her curricula, we assume he and Mr. Harries endorse these t-shirts. Mayor Bloomberg can purchase some for his next campaign. 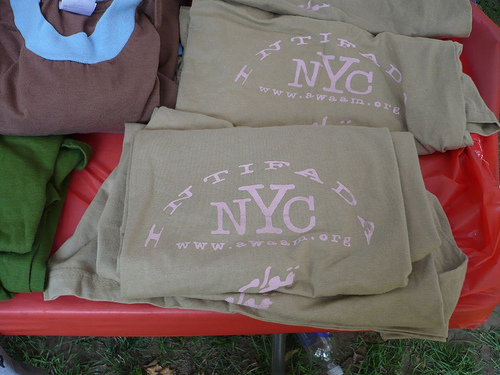 The t-shirts read: “Intifada NYC – awaam.org.” Let’s consider what those words mean. Arabic for uprising. Starting in 1987, Palestinians have engaged in an intermittent intifada against Israel on the West Bank and Gaza Strip in their pursuit of a Palestinian state. So “Intifada NYC” means…what? An uprising in New York City – against whom? or an uprising against Israel, but in New York City? Your guess as good as ours. Here’s what we know – this slogan and logo are this summer’s big publicity campaign for that website that is also listed on the t-shirt: awaam.org . That awaam.org website can be found here – http://www.awaam.org – for the Arab Women Active in the Arts and Media. Who is the founder and a board member of the Yemeni American Association? Dhabah Almontaser, principal for KGIA. Their office is indeed at 464 Third Avenue & 9th Street, Brooklyn, NY 11215, where the AWAAM is receiving postal mail. This is the woman Mayor Bloomberg, Chancellor Klein and Garth Harries consider a model principal, for others to emulate. These are the views they espouse as multicultural enrichment of the curricula. “Intifada NYC” – not just a slogan, an educational initiative from the Department of Education. If she approved these t-shirts, she is not just an Islamist in her views, she is advocating an Intifada in New York City. Your choice what that actually means. She should be fired, and Chancellor Klein should shut down the KGIA project. If these t-shirts were designed, approved, manufactured, received, stored, brought to the Arab Fair and sold by an organization associated with the Yemeni American Association, and she knew nothing of the matter (or did not disavow it if she did), then she is negligent in the extreme and should be fired, and Chancellor Klein should shut down the KGIA project. No third choice exists . Who’s looking out for hate crimes against Americans? Surely this qualifies. We are voluntarily accepting a position of dhimmitude. Get these *bleeping* *bleeps* out of my city! I can not believe that this school can be allowed to open with public funds when it is in direct violation of the separation of church and state, where have the courts and the public been in allowing this to proceed? If arabic women need their own school and of course it has to follow Islamic law it should be funded by private funds and not with taxpayer monies. THIS IS A DIRECT VIOLATION OF CHURCH OF AND STATE!!!!! UNBELIEVABLE TODAY!!!! !